Researching in libraries, archives, genealogical societies, historical societies and other repositories can be intimidating for some genealogy researchers. This guide will give you some constructive “do’s and don’ts” so that your contact with a repository—whether it is in person, by email or telephone—is successful.! The Researching in Libraries and Archives Legacy QuickGuide™ contains useful information including terminology, a list of “do’s and don’ts”, a list of supplies and apps, and more. 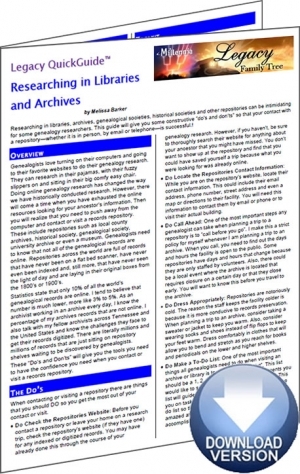 Also included are links to websites and resources covering many archives and repositories for genealogical research. This handy 4-page PDF guide can be used on your computer or mobile device for anytime access.